Dr. Christian Naus received a PhD in Anatomy (1985) from the University of Western Ontario (UWO), followed by postdoctoral studies at the Scripps Clinic in Ja Jolla, CA. 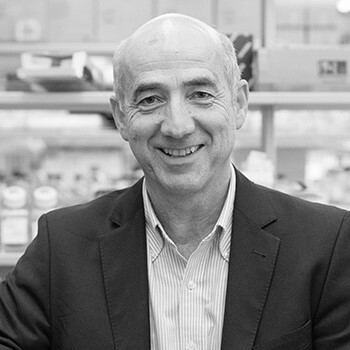 He started his academic career as an MRC Scholar in the Faculty of Medicine at the UWO in 1987, where he developed a successful research program in neurodevelopment and disease, focusing on the newly emerging family of genes which encode the proteins forming unique intercellular gap junction channels. As a full professor, he was recruited to the Faculty of Medicine at UBC in 2002 to Head the Department of Anatomy & Cell Biology. In 2003, he was also appointed interim Head of Physiology as he guided the merger of these two Departments into the current Department of Cellular & Physiological Sciences. He became Director of the Life Sciences Institute from 2009-2013, promoting the interdisciplinary goals of this multi-Faculty and multi-Department research unit, dedicated to discovery research in biomedical and health sciences. Dr. Naus held a Canada Research Chair in Gap Junctions in Neurological Disorders, and is an elected Fellow of the Canadian Academy of Health Sciences. Dr. Naus’ research program explores the role of gap junction channels and their proteins (connexins and pannexins) in disease, including consequences of mutations on gap junction structure and function, and the role of these intercellular channels in diagnosis of disease and development of novel therapeutic strategies. He has conducted over 25 years of research in neurobiology and cancer, focused on cellular and molecular studies to characterize the role of gap junctions in proliferation, differentiation, transgenic mouse models of neurological disorders, and preclinical therapeutic studies for cancer, stroke and Alzheimer’s disease.